Research reveals approximately a third of the fragments in the Staffordshire Hoard come from a very high-status helmet. Helmets of its kind are rare – the Staffordshire Hoard helmet is one of a very small number to be found from this period. Two reconstructions of the helmet have been created, nearly 10 years since the Staffordshire Hoard was discovered, and will be on public display at Birmingham Museum and Art Gallery and The Potteries Museum and Art Gallery from Friday 23rd November. 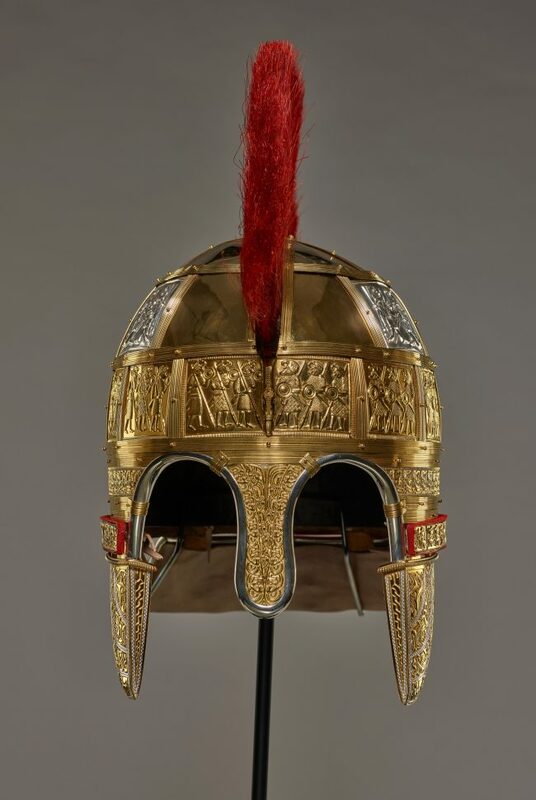 Birmingham Museums Trust and The Potteries Museum & Art Gallery, Stoke-on-Trent have today revealed two reconstructions of a magnificent helmet contained within the Staffordshire Hoard. 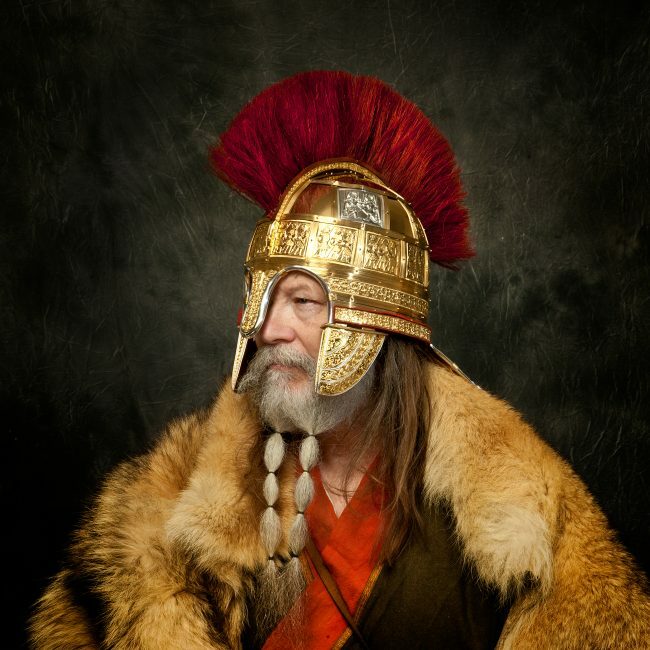 Helmets of this period are incredibly rare - there are only five other Anglo-Saxon helmets known. The detail and bold crested design means the Staffordshire Helmet is likely to have had an important owner. Two helmet reconstructions have been created to showcase how the original may have looked. From today (Friday 23rd November), these reconstructions will be shown simultaneously at Birmingham Museum & Art Gallery and The Potteries Museum & Art Gallery, which care for the collection on behalf of joint owners Birmingham City Council and Stoke-on-Trent City Council. Significant parts of the original helmet, including the steel base which provided the shape, are missing, and the surviving helmet parts are too damaged and incomplete to be re-joined. Despite the intensive research project, there are still many questions to be answered about the helmet, including who exactly it would have been made for. 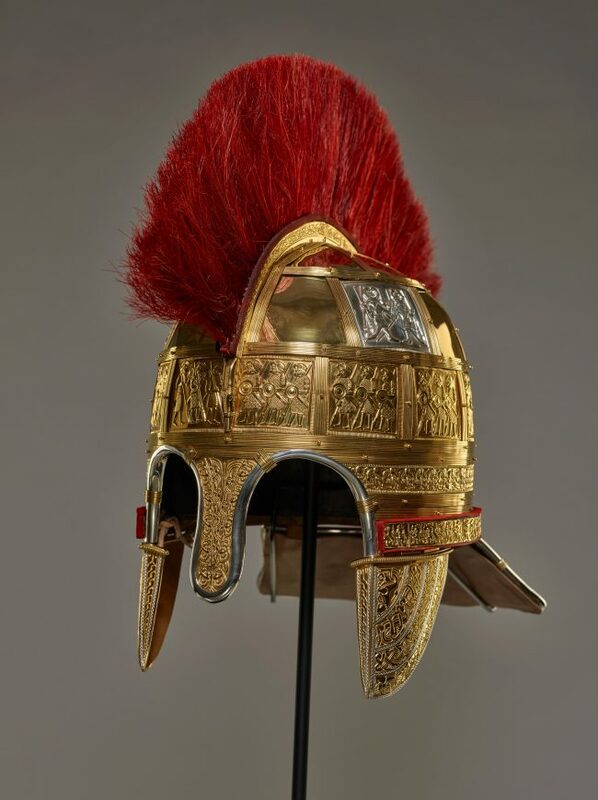 The Staffordshire Hoard helmet is comparable to the Sutton Hoo from Suffolk, of which a famous reconstruction is on display at the British Museum. That helmet is thought to have belonged to a king or prince, and the Staffordshire Hoard helmet is similarly impressive. “The Staffordshire Hoard continues to attract interest from across the world, amazing visitors with its dazzling glimpse into ancient Angle-Saxon life. 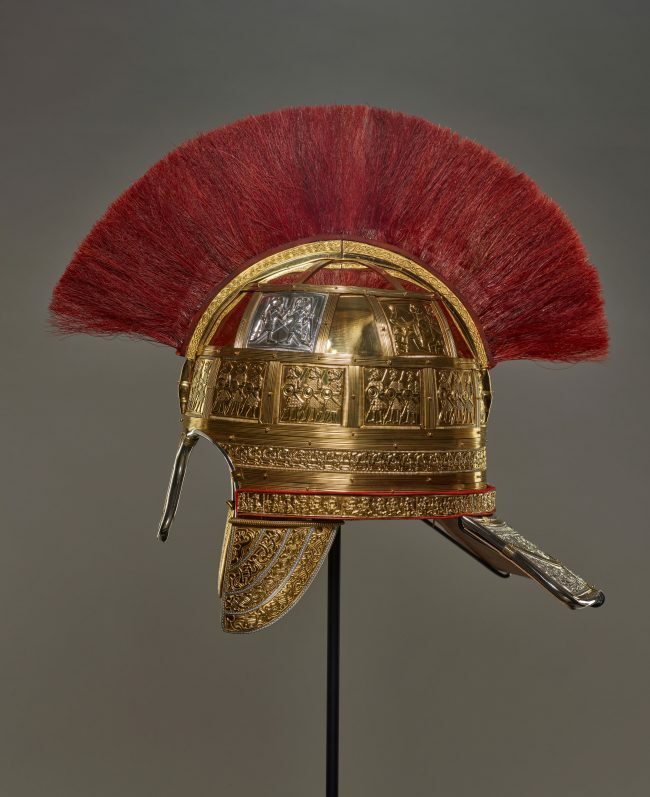 These reconstructions of the helmet are an extremely important development, and another example of the incredible skills and knowledge which are helping to bring the story of the Hoard to life. “Thanks to the specialists at BCU’s School of Jewellery, Gallybagger Leather, Drakon Heritage and Conservation, and metalsmith Samantha Chilton, for the work they’ve done to recreate part of the region’s forgotten history. The helmet reconstruction project was made possible through fundraising by Birmingham Museums Trust and The Potteries Museum & Art Gallery, Stoke-on-Trent, and is based on a major research project funded by Historic England and the museums. The research will be published in 2019 by the Society of Antiquaries and Archaeology Data Service. The helmet reconstruction project team included Birmingham Museums Trust, The Potteries Museum and Art Gallery, Birmingham City University School of Jewellery, Drakon Heritage and Conservation, Gallybagger Leather, Royal Oak Armoury and metalsmith Samantha Chilton. George Speake and Chris Fern were the specialists responsible for the research on which the reconstruction is based. For more information from Birmingham Museums Trust please contact: Zoe Turton, PR Officer on 0121 348 8281 / 07868 204 711 or [email protected]. For more information from Stoke-on-Trent City Council please contact: Andrew McCreaddie, Marketing and Communications Officer on 01782 233653 or [email protected]. The Staffordshire Hoard is the most spectacular Anglo-Saxon find since the excavation of the Sutton Hoo ship-burial (Suffolk) in 1939. It was discovered in July 2009 by a metal detectorist, a mix of around 4,000 gold, silver and garnet items weighing nearly 6kg. Most of the collection consists of fittings from weaponry. These were stripped from swords and seaxes (single-edged fighting knives), at least one helmet and other items, and probably represent the equipment of defeated armies from unknown battles, of the late 6th and 7th century AD. Although fragmented, damaged and distorted, the hoard’s remarkable objects represent the possessions of an elite warrior class, stunning in their craftsmanship and ornament. Why it was buried, perhaps before c.675 AD, is not certain. Significantly it was discovered close to a major routeway (Roman Watling Street), in what was the emerging Kingdom of Mercia. Warfare between England’s many competing regional kingdoms was frequent. The Staffordshire Hoard bears witness to this turbulent time in our history. The Potteries Museum & Art Gallery, Stoke-on-Trent is one of the services delivered by Stoke-on-Trent City Council for its residents. It boasts a series of internationally-renown exhibitions, including the world’s best collection of Staffordshire ceramics as well as the Staffordshire Hoard. All of the museum’s collections are categorised as designated collections, recognising their national importance. Galleries also include fine and decorative arts, costume, local history, archaeology and natural history. The museum provides an engaging programme of exhibitions, activities and learning experiences for the city’s residents, schools and visitors to the area. It has a number of national and international partnerships across Europe and from the USA to China, delivering world class activities and exhibitions. We are Historic England the public body that helps people care for, enjoy and celebrate England’s spectacular historic environment, from beaches and battlefields to parks and pie shops. We protect, champion and save the places that define who we are and where we’ve come from as a nation. We care passionately about the stories they tell, the ideas they represent and the people who live, work and play among them. Working with communities and specialists we share our passion, knowledge and skills to inspire interest, care and conservation, so everyone can keep enjoying and looking after the history that surrounds us all. Located in the heart of Birmingham’s famous Jewellery Quarter, Birmingham City University’s School of Jewellery was founded in 1890 and is the largest of its kind in Europe. The School of Jewellery boasts industry-standard facilities, including specialist horology labs, 3D printing, silversmithing, jewellery and gemmology laboratories. Courses at the School of Jewellery cover all aspects of jewellery from the conceptual fine art-based approach through to industry-focused, technology driven courses.